I've been a home owner for about two years now, I've put in a lot of work into our home as well as have hired contractors a few times to do some heavy duty jobs. I love to design & decorate, however, being a single parent & with my schedule sometimes I just don't have the time to spend hours painting or re-doing a wall. Well, thanks to InkShuffle, I can give a room or wall a new look with Easy-Off Wallpaper! Now let me explain before you think this is the same wallpaper that's in your grandmother's old house, trust me, it's not! Before InkShuffle I would of never, ever thought about putting wallpaper on our walls in our home, but after customizing my own wall mural & seeing the products in person, I'm glad I gave it a try! At InkShuffle they sell two products, Easy-Off Wallpaper & lluma Prints, you will find a ton of categories for each product or you can upload your own photo. These HD quality, high-end wall murals are the perfect way to spruce up a home office, your children's playroom, even your kitchen! Once you've selected the image you'd like for your wall mural (or uploaded your own), just click the "buy" button, then you will be taken to the next screen that allows you to customize your mural. Choose your wall size, then you can crop the image if you wish, you can even change the color, contrast, or rotate the image! Once you're satisfied with your image, add it to the cart & your done! Your Easy-Off Wallpaper will arrive & then it's time to get to work! 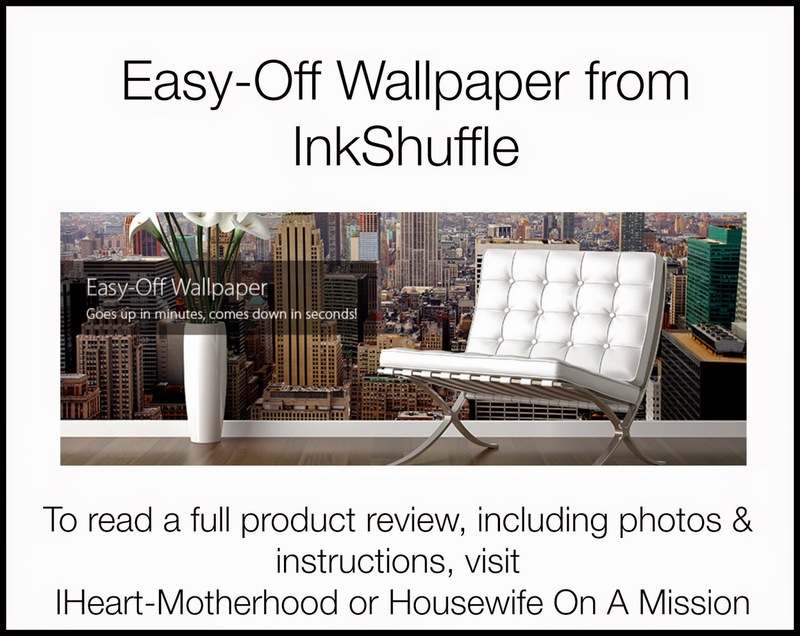 InkShuffle provides detailed step by step directions on their website, but with a few steps & an extra set of hands, you will have no problem hanging your new wall mural! You need a few tools to get you started as well - a wallpaper tray, rag, step stool or ladder, plastic squegee, a trim guide & a box cutter knife (if you have one handy, if not, scissors work just fine). Once you have chosen the wall in your home that is perfect for your new mural, be sure to wash it with soap & water, fill your tray with water & place it underneath the leftmost panel at the foot of the wall. You're going to install your panels from left to right, each of mine had three panels. Roll the first panel tightly, gently lower the roll into your wallpaper tray, slowly pull the panel upwards until you reach your desired height. To apply the top half of the panel, begin squeeging from the center of your mural, up. Be sure to begin at the left side & repeat the process until you've reached the right side. You can use your hands to position the wallpaper to your liking, I had to move mine several times, because it was quotes, it was a little harder to line up then the baseball image in my son's room. When applying the bottom half, start from the left as well, squeegee from the center down & repeat until you've reached the right side. Once your happy with the panel, you can trim off the excess material & move onto the next panel. Follow the same steps for the first panel, for the 2nd & 3rd ones. Overall, I'm really happy with the look of my new walls thanks to InkShuffle! So what do you think? Would you consider putting up Easy-Off Wallpaper on your walls? Be sure to visit InkShuffle online to purchase your own Easy-Off Wallpaper & feel free to stay connected with them on Facebook & Twitter!